Charles Daniels left the corporate world a few years ago and joined the small, family-owned Wepco Plastics Inc. where he has served as CFO since 2013. Known for moving around in his career, Daniels says he’s there to stay, knowing he’s played a big role in helping turnaround the Middlefield-based injection-molding company. When Daniels came on board, he was charged with planning, budgeting and getting the business operation in line. It was a tough time for Wepco. After 9/11, they lost a lot of customers because other industries had slowed down and companies were going overseas for short-run production and product development. Once 50-plus employees strong, Wepco had dwindled to just 12 workers. People were covering multiple jobs and doing too much overall. When Wepco President David Parmalee suggested hiring his childhood friend, Daniels, and company owner Waldo Parmalee agreed to it, things changed drastically. Specifically, Daniels since 2014 has helped increase the company’s income by 13 percent and net profits by 203 percent through cost reductions and grant revenues. Wepco now employs 23 people and specializes in prototypes and short- to medium-run production of plastic-injection molded parts that are designed by customers in the consumer goods, defense, marine, electronics, medical and aerospace industries. They ship to an average of 50 customers a month and work with approximately 150 companies each year. Daniels, 40, went to college for hospitality management and worked at Marriot International and Bank of America. He started a small business consulting company and got his MBA. He’s currently studying to become a certified management accountant (CMA). Daniels and both Parmalees go back nearly 30 years. Daniels and Dave Parmalee played on the same little league team, and Waldo Parmalee was their coach. 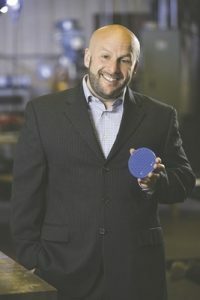 Daniels’ current “big crusade” is partnering with different Connecticut institutions, community colleges and tech schools to change their curriculums and become more specialized in certain areas in order to help groom a future workforce for the many injection-molding companies in the state. “My goal is, hopefully it will take off and they’ll have a good selection of students every year who can come out into the workforce ready to contribute. And we’ll further that by sending people back for continuing education,” Daniels said. Daniels said he is “constantly looking for new ways to get more bang for our buck.” He earned a grant through Eversource that helped the company examine its business methods, including how it obtains quotes and processes orders. The exercise has helped the company trim costs, reduce lead time, improve customer satisfaction and increase revenue. Daniels has also helped Wepco use the state’s Subsidized Training and Employment Program (Step Up), which reimburses 50 percent of training costs if a company hires people who are unemployed. “It’s investing in our workforce and in our future. Before we weren’t sending people to training courses because it was expensive and we were losing them for a week,” he explained. Under Daniels’ leadership, Wepco has doubled its trade-show appearances and obtained a grant through the state’s Manufacturing Innovation Fund Voucher Program that allowed it to purchase a software program for its design/mold-building room. Daniels recently participated on a panel discussion for The National Fund, where he discussed ways to help underemployed people, ages 18 to 29, find jobs. He spoke about the ways Wepco trains youth and how the company finds and works with young people. Looking toward the future, Daniels said he wants to improve networking with similar companies in the industry. “Even though we’re looking for the same type of business, if we can work together and save money or share ideas and things like that, there’s some opportunity to share resources,” he said. 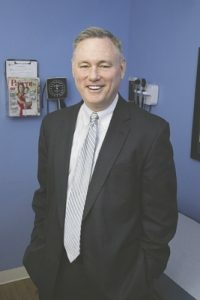 Since Paul Falvey took over as CFO of PhysicianOne Urgent Care in 2015, the quick-service healthcare provider has doubled its number of locations in Connecticut, Massachusetts and New York from nine to 18. He focused on building a team to tackle areas such as finance, operations and real estate, and searched for communities that lacked urgent care, including Glastonbury. The market has been receptive to these facilities, Falvey said, which treat non-life-threatening medical conditions and are a cost-effective alternative to the emergency room. PhysicianOne Urgent Care is owned by physicians and private equity investors and was formed in 2008 by three ER physicians in Southbury. It’s growing a Greater Hartford presence and now has 12 centers in Connecticut, four in Massachusetts and two in Westchester County in New York. Plans for expansion are ongoing and Falvey is helping lead those efforts. While building his team, Falvey, who started his career as an accountant and has been involved in medical technology companies and healthcare services companies since the early ’90s, said he’s focused on financial and project management. “It’s all about making sure you have the right people in an organization because in a smaller resource limited company you have to have people who are willing to do more with less and who don’t necessarily see any barriers to their job and what has to get done. That’s the vision, and the way we approached it,” he said. Lynne Rosen, PhysicianOne Urgent Care’s CEO, said Falvey’s role and impact go well beyond optimizing the company’s performance. Insurers have been very welcoming of urgent care centers because it’s a low-cost alternative to the emergency room. And while value is “a big part of the equation,” quality and patient care are equally important, Falvey said. And patients are happy that urgent care exists. “I think it complements the fact, from a cost-efficiency perspective, it’s good care in the right place at the right time,” he noted. Falvey was tasked with securing capital to finance PhysicianOne’s growth. The group is supported by PineBridge Investments and Pulse Equity Partners. In the past year, they were financed by Enhanced Capital Partners LLC. Hitesh Shah, Enhanced Capital Partners’ vice president, said Falvey has played a key role in successfully planning and implementing PhysicianOne Urgent Care’s growth initiatives last year and has positioned the company to grow more rapidly in Connecticut. PhysicianOne Urgent Care is a member of the Urgent Care Association of America. In early May 2017, Falvey traveled to Washington, D.C., to support legislation that would provide veterans greater access to urgent care centers. What’s the vision for PhysicianOne over the next year? 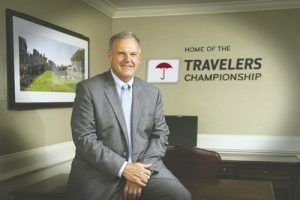 Andy Bessette’s love of athletics has ultimately led to his nearly four-decade career at The Travelers Cos. and the insurer’s title sponsorship of the professional golf tournament, the Travelers Championship. “I worked in the mail room. I worked in the supply room. I worked my way up from all those basic functions you need to run a company,” he said. By far, one of Bessette’s biggest accomplishments was working with Fishman in 2007 to take charge of what would become the Travelers Championship. Through research they found that golf was the most popular sport for insurance companies. Bessette also spearheaded other projects, such as creating a fitness center in the 1980s that survived through the 2000s, renovating the Travelers’ tower and rebuilding the outdoor plaza. Bessette is a member of many boards and organizations, but as a 1975 graduate of the University of Connecticut, being on the school’s board of trustees is particularly special, he said. He is also the vice chair of the Capital Region Development Authority, which is responsible for housing and leading development and growth in the region. Special events coordinator Margaret Lawson, who is now a private consultant, has led a storied career. She’s rubbed elbows with U.S. and foreign presidents, was a contestant (and winner) on the TV game show “To Tell the Truth,” and earned the keys to the city of Munich, Germany. She’s also broken barriers, becoming the first female president in the history of The Hartford Club. The daughter of Scottish and Hungarian immigrants, Lawson grew up in Milford and graduated from Bryant University at age 19 with a bachelor’s degree in marketing and sales. In the 1960s, she joined Arthur Lumsden at the Greater Hartford Chamber of Commerce where she worked for 18 years, moving her way up from assistant to vice president and corporate secretary. At the time, the chamber was “the social hub of Greater Hartford,” and people would do anything to get on Lawson’s invitation list to events. One moment she’ll never forget is getting clearance from the U.S. State Department to travel to Germany and help Lumsden organize local business communities there. That’s when the Munich mayor gave her the key to the city. In 1973, she became one of the first two women to join The Hartford Club. Ten years later, she was the club’s first female president, helping make the club profitable again. She’s still on the club’s board and has raised over $1 million for the organization. Peter Kelly, founder of Hartford law firm Updike, Kelly & Spellacy, said Lawson “single-handedly” saved the club when it was going through financial struggles. 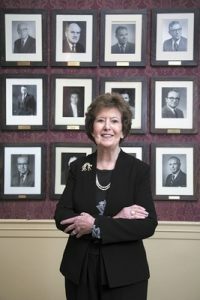 In 1981, Lawson became the vice president of marketing and the first female executive at specialty insurer Hartford Steam Boiler at a time when women weren’t readily accepted in the corporate workplace. She stayed for 28 years. One of her first tasks was deciding what to do with the vacant 20th floor at their new building on One State Street. Lawson was responsible for advertising and public relations with the goal of expanding Hartford Steam Boiler’s brand recognition worldwide. She hung a model of the company’s logo in New York City’s prestigious 21 Club and put ads in Fortune magazine about Steam Boiler’s involvement in the development of the channel tunnel between the south of England to northern France. In the late 80s and early 90s, Lawson created a model on workplace fundraising campaigns, starting with Hartford Steam Boiler. In just a few years, she raised a couple million dollars from employees alone. “Other companies looked at this model and they adapted it to their companies and their employees. And pretty soon we recruited 60 companies in the Hartford area that had workplace campaigns,” she explained. Lawson also organized CPTV’s 50th anniversary celebration in 2013 and raised $1 million for the network to create a Learning Lab that helps veterans, high school kids and others learn technical and other skills. “I think probably the best characteristic for this job is I’m a little bit fearless about talking about things. And as I’ve gotten older I’ve gotten more fearless, not less,” she said. Clark was not a nurse, had never worked in a college environment, and Scheinberg did not own a single piece of land near the river, yet they were not deterred. “You see this marriage of two people going, ‘What could go wrong and how could we not accomplish whatever it is we set out to do?’ ” she said. When she began working with Scheinberg, he told her to find the biggest problem and fix it. Over the years, Clark has worn many hats: chief academic officer, chief operations officer and chief of staff. She also worked in human resources and payroll. She is a bit of a “guru,” according to Scheinberg. In March, the nursing director told Clark that an assistant mistakenly sent out a letter of acceptance to a student. Clark had to smooth things over with the family. “I feel really bad we did something to hurt this girl,” she said, adding that the college offered to do whatever they could to rectify the situation, such as providing a tutor. And as long as the student earns the right to enter the program, the college will also pay her tuition. According to Scheinberg, Clark has a talent for saying the right thing in not-so-great circumstances. “What’s beautiful about Ann is that people are comfortable and feel safe in her judgment when she’s making tough conversations in a very, very honest and authentic way,” he said. A few years ago, Clark established an endowment scholarship named the David Award after author Malcolm Gladwell’s book, “David And Goliath.” Her husband is also named David. It was created for “the little person who’s had a tough road and gutted it out,” according to Clark. One of her goals is to get the endowment to a sustaining level before she retires, which isn’t happening in the foreseeable future. Clark continues to look towards the future of Goodwin College. Expansion plans include an international student market as well as residential halls. The college is also in the process of incorporating a master’s degree program. “That may be my last hurrah,” Clark said. Every year her staff meets at a retreat, and she asks them if it’s time for her to go, and every year they keep saying “no.” As long as she can continue to contribute, Clark said she will keep working. “My legacy is to see this organization thriving and offering the same kind of support to students who have had a pretty tough way,” she said. It’s not often that one female managing partner succeeds another, but that’s what happened with DelMonico at Hartford law firm Murtha Cullina, which has six offices in three states. She took over the managing partner position from one of her mentors, Elizabeth Stewart, who helped hire her. Prior to becoming managing partner, Delmonico was chair of the firm’s litigation department. DelMonico managed the 50 or so litigators at the time, making sure everyone’s workloads were balanced and “no one was going insane,” Stewart noted. Meanwhile, Delmonico was continuing to grow the department and helping ensure junior attorneys were learning the practice of law — an enormous responsibility. “We expect our people who are in those management positions to actually still practice as a lawyer as well,” Stewart explained. “And she did do that. And I think in the midst of that had her third son. It was definitely a heavy load.” DelMonico, 43, is the mother of three children, ages 13, 11 and 7. In the meantime, once a year she gives the “Murtha Talks” to make herself available to the firm’s employees. “I definitely believe the more you get to know someone on a personal level the better you work together, especially because we emphasize teamwork so much,” she explained. DelMonico is also a mentor. There is a formal mentoring program for all of the firm’s employees as well as a Women Expanding Business group. She believes one of the reasons the firm has done such a good job retaining women is because there are females in leadership and partnership positions who have done it and understand the challenges. Thirty-eight percent of the firm’s attorneys are women, higher than the national average. In February, she presented a seminar entitled: “An MBA Brain in a JD Head: Business Principles Every Lawyer Should Know” at the national DRI Women in the Law Conference in Arizona. “One of the challenges as the industry gets more competitive is you don’t want to just provide legal advice in a vacuum. You want to really understand your client’s business and how it runs, the challenges that they’re facing and provide legal services in that context,” she explained. “Part of my role as managing partner is to be outward facing and external, helping get the firm’s name out there and working on the various initiatives to improve the Connecticut economy and make it a business-friendly place,” she said. “I just discovered a love for strategy and getting under customer insights and customer needs and really listening to the voice of the customer and designing either products or customer solutions for them that hadn’t existed before. That unlocked this passion of mine to pursue more of a strategy role,” she said. “I think that, in terms of a professional accomplishment, it is really a great representation of what the team did and how we all worked together to make work meaningful and to make people understand, ‘If I work hard at this, I have these other opportunities,’ ” she said. One of the first things she tackled was the Living Up To You initiative with the goal of “winning the hearts and minds” of internal employees. “You can advertise anything, but if your employees aren’t really supporting it, it’s not going to work because the first time a customer comes in, if they don’t experience what you’ve been saying it’s going to die,” she said. The 2016 brand summit was the first of its kind at Webster. Everyone involved shared their insights on the various lines of business, customer insights, marketing measurements, etc., in one place. It enabled those involved to see common threads and work to make Webster’s brand promise even stronger. “It was probably the most powerful 48 hours of my career,” Morris noted. In addition, Morris is the co-chair of the Governor’s Prevention Partnership, whose aim is to prevent substance abuse, underage drinking and violence among young people. Joseph F. Brennan, president and CEO of the Connecticut Business and Industry Association, serves with her on the board.